Two south London fellows called Alan Lancaster (bass) and Francis Rossi (guitar) founded the band "The Spectres" in 1962 (see The Spectres (2)). At that time, Mr. Rossi preferred to call himself Mike after one of his second names. In 1966, the band changed their name to "The Traffic", shortly thereafter to "The Traffic Jam" (see The Traffic Jam (2)). The lineup consisted of Lancaster, Rossi, John Coghlan (drums) and Roy Lynes (keyboard). A year later, the band changed name once again to "The Status Quo". 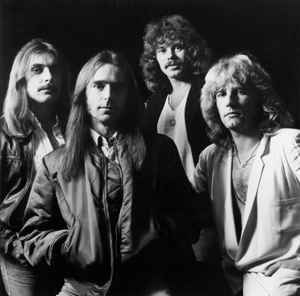 Rick Parfitt (guitar) joined the band. Their first hit record, "Pictures of Matchstick Men", was released. "The" was omitted from the name of the band in 1969, known thereafter as just "Status Quo"